I hope you had a lovely Easter weekend. I spent mine trying to get up a staircase. One of the more daunting tasks ahead of me with the Del Prado house is constructing the staircase. I've never built one before. According to the instructions it should be a simple matter of a dab of glue and slotting the pieces together. We know how that worked out so far. I started by finding all the pieces, and doing a test assembly. Surprisingly easy! Then I put it in the hallway to see how it looks, and discovered that it doesn't fit. This is not Del Prado's fault. When I replaced the outer shell of my house with solid sheets of plywood, I didn't take the thickness of the wood into consideration. As a result, I had to trim 5mm off the back of all the interior walls to make them fit. Now I had a staircase sticking out in front of the kitchen door. Sigh. Why does a small little problem like 5mm always come back to bite you in the bum? I could cut off the banister I suppose, but the more I stood there and got upset over it, the more I wanted someone else to blame. Then I noticed something so glaringly stupid that I couldn't believe I hadn't noticed it before. April fool!!! A dollhouse person would go running up the stairs and smack his face against the back wall. There is no landing! Not even Escher would have done something that crazy. I'm all for a bit of deceiving the eye. Doors that lead nowhere, for instance, don't bother me at all. But a staircase that runs up against a wall, just not on. Obviously the staircase needed a turn in it. That would make it shorter to both not stick out in front of my kitchen door and not run into the back wall. I set about making a mock staircase with cardboard to see how I could possibly alter it to make it work. A bit of Lego to keep the right angles, a bit of glue... Voila! Much easier than I thought. Except when I fit it into the house to test it, I realized that it would now run smack up against the side wall. Duh! In addition to that, there was no way to put a turn in the stairs without cutting the corner off the door-that-leads-nowhere that I intend to install against the back wall. I learnt something here. Unless you want impossibly steep stairs that run up against a wall, you need a much wider hall, or much more height to the ceiling. Neither of which I was going to get without rebuilding the entire house. After a weekend of ripping up mock staircases and cursing my inability to think in 3D, I finally found what I think is an elegant solution. I'm going to make a small downstairs landing, with triangular stairs that angle around the corner. The staircase is going to run from the back of the house to the front. How the dollhouse people are going to carry their couch around the corner and up those stairs is not my problem. I will have a plausible staircase, my downstairs nowhere-door will have more than enough room, and as a bonus, the entire downstairs hall will not be hidden behind the staircase. Instead, I will have a lovely interesting space under the stairs to play with. I will repeat the same design for the stairs leading to the attic rooms. I will need to re-cut the stairwell holes, but since I haven't worked on the upper storey floors yet, it is not a problem. After an entire weekend my staircase doesn't look like much, but it will soon. I can't wait to work on it some more! The only downside to my design is that once the staircase and interior walls are installed, one won't see much of it. Unless you have a periscope. Or one of those angled little mirror thingies the dentist uses. Is there a dentist in the audience? Thank you, Sheila, I'm having so much fun with this! What a fabulous solution and the space in front of the staircase will no doubt be fun to play with. About 'angled little mirror thingies' a mirror on the wall next to the door that leads to nowhere would give great glimpse of your stairs. Just a thought. Anna, you are a genius. Of course there will have to be a mirror! Hi Megan, I can't begin to tell you how comforting it is to know that you have been struggling with EXACTLY the same staircase issues as I have, and like you, I've had to re-think the direction of the run of my staircase after becoming aware of an otherwise non-existant landing. I APPLAUD your BRILLIANT staircase mockups and that you've found the perfect solution for your particular dilemma. I think that your new staircase is going to solve more than one problem since you'll GAIN some additional display space along the way- BONUS! I Love Anna's idea of a mirror adjacent to the door for that extra viewing pleasure which might also bounce extra light UP the staircase once you've installed your lights. There is definitely going to be a slanted mirror to give just a glimpse of the staircase. When I make the attic stairs, I might leave them open, so one can look through the stairs from the back. Let's see. I absolutely loved the progress on your dollhouse this week. It is such a satisfying feeling when you find a GREAT solution to a complicated problem! The open feel of both hallways is truly an added bonus, and makes the whole challenge seem almost kismet. I love when that happens in a build! Truly lemons to lemonade! Nice job! Thank you Jodi! With future builds I will definitely consider omitting the staircases entirely. They take up a huge amount of space that could be used for other things, and an unfair amount of time to make too. But if I install them in this house, I can say 'been there, done that'. Yes I ran into the same problem with this house. I thought of a mirror while I was reading your post and see it has already been suggested. Glad you found a workable solution! Thank you Rosa! Just saw the beautiful Easter display on your blog, you are so talented. I love bunnies! Ha! 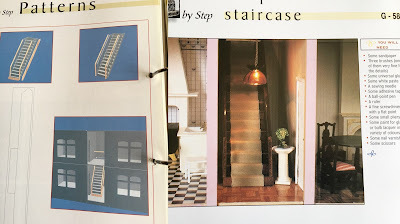 Staircases are the bane of many a miniaturist's life and I've had similar struggles with them in houses I've kit-bashed too. So much so that these days I generally do away with them altogether and use the space for something else! As for not being able to see the stairs in your neat resolution, how about a mirror at the bottom of the stairs, which would be visible through the opening, and reflect your staircase in all its glory....? In future houses, I'm going to omit staircases. One can make a whole room in the space they take up. A mirror is a brilliant idea and I'm definitely going to do that, thank you! It is amazing how much trouble staircases can give a miniaturist. I have seen many projects where people take them out altogether. I think your solution will work really well and will look realistic. It is a shame that you will only see it through an opening...but it adds a lot to the project. Hang in there and keep up the good work. Thank you Giac. Since I'm in the midst of it, I will complete this staircase. But in future builds I will omit stairs entirely. Several people suggested a mirror in the stairwell, I think that is the perfect solution for this backwards situation. Hi Megan! Struggling with this problem was indeed tough for you, but I think it was worth it all, because you came up with this brillant solution :). So clever of you! And if I was you, I would definately place an angled mirror (or a spying mirror ;O) on the landing, othwerwise it's such a pity for not seeing anything of that difficult staircase ;O. An angled mirror it will be! Thank you so much Ilona, I don't know why I didn't think of it myself. I hope that you are enjoying springtime in the beautiful area where you live. Hi Megan! It´s funny how we try to make sense of our dollshouses and how we all have things that we dont negotiate with. I am ok with staircases, I even have houses without them but I understand you as I have been there with problems like, no bathroom? it´s not possible! I made a huge terrace and built an entire outside bathroom and shower on my beach house because there was no space inside for it! Well, just saying that I can relate, we are all a bit crazy *lol*. You have found a brilliant solution!! Well done girl! Alexandra, my future houses will have no stairs. One can use that space for an entire room. A bathroom for instance, ha ha. But I know exactly what you mean. I hava an old house that I've been restoring for years. It has only four rooms. I had the idea of making it into an artist's workshop, with one of the rooms an indoor garden. There was no space for a bathroom or kitchen. After working on it for a while, it bothered me so much that I took it all apart and started over. I divided one of the larger rooms so that there can be a tiny bathroom and a kitchen. Like the grungy artist would have minded. Probably he never washes and only eats fish and chips! Definitely a mirror, Birgit! Don't know why I didn't think of that sooner. Well done Megan, and all in a weekend! Your head must have been spinning. It is a great solution and gives you that extra space under the stairs which may compensate for not being able to see the staircase. We all know what a staircase looks like so I think you will have more fun with the gained space. Thanks, Janine. I think stairs are over rated. As you say, we all know what they look like. With my next build I will omit them entirely. But now I can say 'been there, done that'. And an angled mirror will give a glimpse of the stairs too! I never thought about the tarantula... wonder if she will manage the narrow turns with all those legs? Love the way your apartment is shaping up, and I admire you for getting so much done between work and other things.